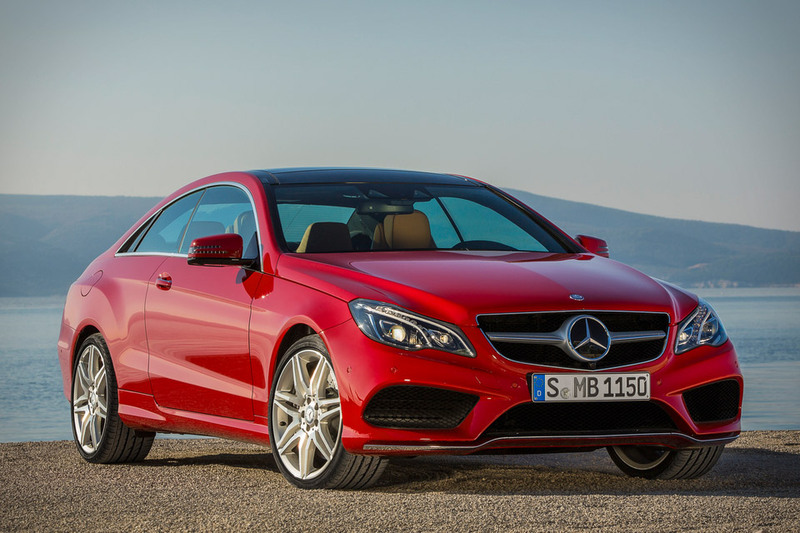 Plenty of cars receive a mid-cycle facelift — but the 2014 Mercedes-Benz E-Class Coupe ($TBA) has more up its sleeve than just a new look. Accompanying the new, sportier front end — which holds new single-lens LED headlamps and large air intakes — redesigned rear fenders, and all new interior is a host of new safety features, dubbed "intelligent drive". Included in this new package is Collision Prevention Assist, a radar-based collision warning system with adaptive brake assist systems, Attention Assist, which can detect when you're getting drowsy, Distronic Plus with Steering Assist which helps to keep the car in its lane and can track multiple lanes of traffic, and a bunch of other futuristic systems that come just short of letting the car drive itself. Available in hardtop or Cabriolet versions, with engines ranging from 300 to 400 hp. No, it's not a totally new car — you can think of the BMW Concept 4 Series Coupe ($TBA) as an extension of the 3 series, although it has one less door. Sometimes. Effectively the replacement for the 3-series coupe, the new 4 series concept is longer, wider, and lower, while retaining much of its younger (?) siblings blood. Features include LED headlights, a huge front air intake, an "Air Breather" behind the front wheels, and, of course, an interior that's probably slightly more progressive than what we'll see in the production version. Slated to arrive at a dealer near you whenever it makes its way out of the "concept" stage. We're not the only ones to be surprised with a Hot Wheels toy instead of a real car over the holidays, but now it's time to turn the tables with the Camaro Hot Wheels Edition ($TBA). The very first full-size, production Hot Wheels car to ever be offered for sale, this limited edition ride is available in V6-powered LT and V8-powered SS trims, offering between 323 and 426 horsepower. Inside, the black leather-trimmed interior is accented with red and black seat stitching and complimented by the MyLink infotainment system, while the Kinetic Blue exterior features a ZL1 rear spoiler and front upper grille, a ground effects package, black 21-inch wheels with red outline stripes, a two-tone matte hood graphic, rear taillight blackout graphic, fender flame graphics, and Hot Wheels logos all around. Arriving in the first quarter of 2013. You've seen the video. Now drive the car. The infamous Otis Maybach ($TBA) driven by Kanye and Jay-Z in their video for the Grammy award-winning "Otis" is coming up for auction. This 2004 Maybach 57 was customized to the max, with the doors removed and mounted as wings, the front grille stuck to the back, an oversized, fire-spewing exhaust, and a crude sheet metal body kit placed over the wheels — and with all the proceeds going to benefit East African drought sufferers, you can feel a little better about spending your dough on what's now essentially a glorified golf cart. Lusting after an M5 but simply don't want or need those extra two doors? Say hello to the 2013 BMW M6 Coupe ($TBA). This third-generation supercar-turned-daily driver is powered by a high-revving 4.4L V8 with M TwinPower Turbo Technology, which produces 560 hp and a 0-62 mph time of 4.2 seconds, a 7-speed M Double Clutch Transmission, an M specific chassis that's more rigid and robust than that of the standard 6-series, optional M Carbon-Ceramic brakes, standard 19-inch light-alloy wheels, available Adaptive LED headlights, a carbon fiber composite roof, a head-up display, and an agressive body that's sure to make sweaty the palms of anyone fortunate enough to spot one in their rearview mirror. Classic looks meet modern guts in the HB Coupe ($TBA). This custom — but fully road-ready — ride offers a full carbon monocoque and a 3.0L inline six good for 306 hp. It sends that power to the rear wheels via a six-speed manual or seven-speed dual clutch transmission, making for a 0-62 time of 4.3 seconds and an estimated top speed of 155. Still in the development stage, it has yet to receive a price — but something tells us the attention it will draw will be worth every penny. MINI's latest redesign meets the open air with the MINI Roadster ($TBA). Arriving in Cooper, Cooper SD, Cooper S, and John Cooper Works models, this powerful pit bull-esque drop-top features power ranging from 122 hp in the standard model to 211 in the JCW, Dynamic Stability Control, a manually operated soft-top roof for that old-timey feel, an optional Harman Kardon hi-fi audio system, and the MINI Connected system with web radio, Google services, an RSS reader, and integration with Facebook and Twitter.